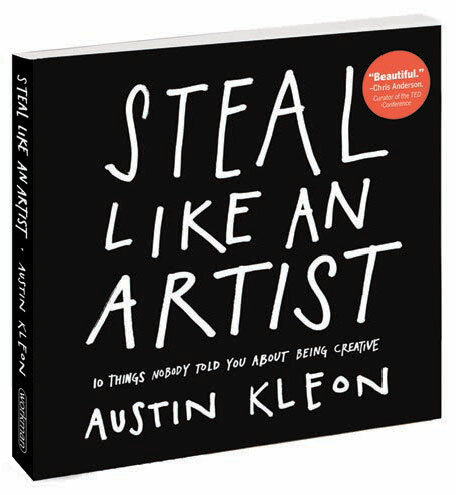 “Steal like an Artist: 10 Things Nobody Told You about Being Creative” by Austin Kleon is a rollicking good read for the creatively inclined and also for those who don’t think they have a creative bone in their bodies. Not only are the pages short, pithy and to-the-point, he chocks each chapter with convincing quotes from pop culture figures along with historical ones to support his ideas. I peeled through its pages during a leg from Manchester to Chicago with rapt attention. I can attest to the fallow ground of not being stymied to the point of inactivity. If you’re going through “writer’s block” or anything similar, I would wager you will find evidence and encouragement enough in “Steal” to get you through your rough patch. Instead of just writing what you know, Chapter 3 suggests to “Write the Book You Want to Read” exploring the possibility of fan fiction as a way to get you going. One of my own responses to “Steal” has been to keep a logbook calendaring the projects, get-togethers, books that have been filling my days and mind with ideas. In the preface, Kleon comments that he writes this book as a letter to his younger self and we get to glean from the benefits of this reflection. The book is laid out in 10 parts with sub-sections in each part. He begins in Chapter 1 with the notion of what it means to “Steal like an Artist” and the distinction between hoarders and how artists are collectors, saving only the “things that they really love.” (p 13) and that might in some way inspire future or present work through their presence. Chapter 4’s call to “Use Your Hands” illuminates the necessary instrument of creative handiwork. I was particularly struck with the truth in how easy it is to hit the delete button when writing a first draft on the computer. Instead of the physical act of crossing out a word or phrase in a notebook, they no longer exist on-screen for the writer to consider later. It’s a good exhortation to write exploratory work first by hand and then in the final stages move it to the digital realm. Pursuing your passions- the ones you do for sheer love and not for profit factor into Chapter 5’s focus that “Side Projects and Hobbies are Important.” Kleon says, “If you have two or three real passions, don’t feel like you have to pick and choose between them. Don’t discard. 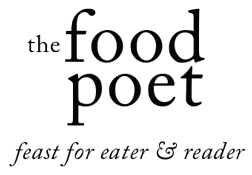 Keep all your passions in your life.” (p 68) This really struck a resonant chord as I have been trying to bring together two of my most vocal passions, food and poetry, into what I share here on the blog. My musician friend Kenny and I were taking a long walk this weekend discussing what Kleon deems is “The Secret” in Chapter 6 to “Do Good Work and Share it with People.” If you are creative, the people you share your work with and the people who get your point of view and what it is you are bringing out of the ether and into existence are priceless. I am grateful and humbled by the readers who spend a few moments of their day perusing this blog. Your readers or viewers can often be the ones who take your work into places you might never have imagined. I could tell you about all the head-nodding during Chapter 8’s “Be Nice. The World is a Small Town” or how true Chapter 7’s “Geography is No Longer Our Master” are from my day job work alone. Perhaps we could dive deeply into the importance of Chapter 9’s “Be Boring. It’s the Only Way to Get Work Done.” Something tells me you might just be head-nodding along from the chapter titles alone. I reckon the best I can do to encapsulate how this book can transform your life or give you a fresh perspective and chance to begin again is to pick up your own copy and pencil in your own jottings in the margins. If you do, share a piece of the book’s wisdom that rang true for you from “Steal Like an Artist.” I’ll add it to my logbook.